On a sunny and hot afternoon, July 6, 1944, thousands of fans made their way to Barbour Street in Hartford, Connecticut to see the Ringling Brothers and Barnum and Bailey circus performance. 167 circus fans never went home. The others returned home with physical and emotional scars that they will bear for the rest of their lives. For anyone who would like to know more about the 1944 Hartford Circus Fire, this website will attempt to provide information about the circus and the fire, as well as remembrances of those who attended the circus on that fateful day. We welcome your input - please send an email to circusfire1944@sbcglobal.net and let us know what you think of the site or share your experiences. 2018, July 6: Added information and photos to Mary Cosgrove's page. Added new page Personal Accounts Page 9. Added Circus Fire Experience essay by Geoffrey Wilson to ESSAYS section. 2018, May 15: Added information and photos to Thyra Smith's page. 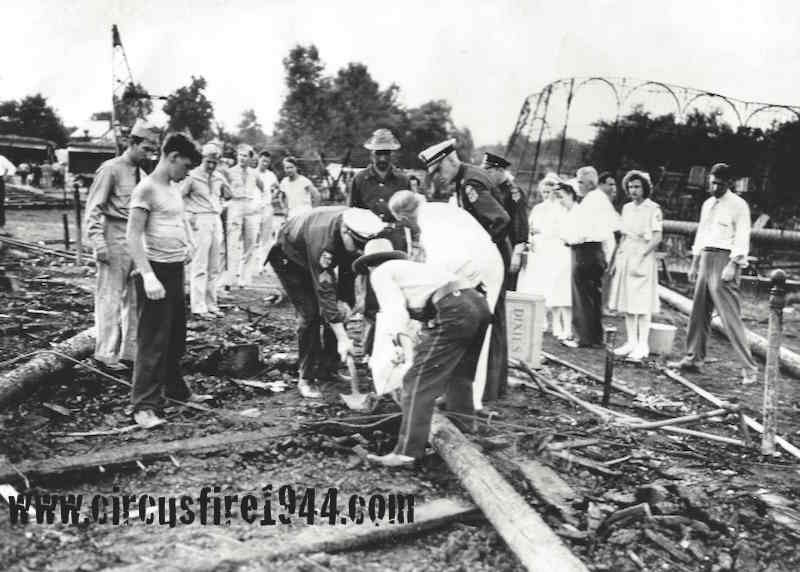 2018, March 11: Added Memories of the Hartford Circus Fire by Diane (Lawrence) Jonardi to the ESSAYS section. 2018, January 20: Added Little Miss 1565 tribute song by Jim's Red Dodge to the Circus Fire Audio page. 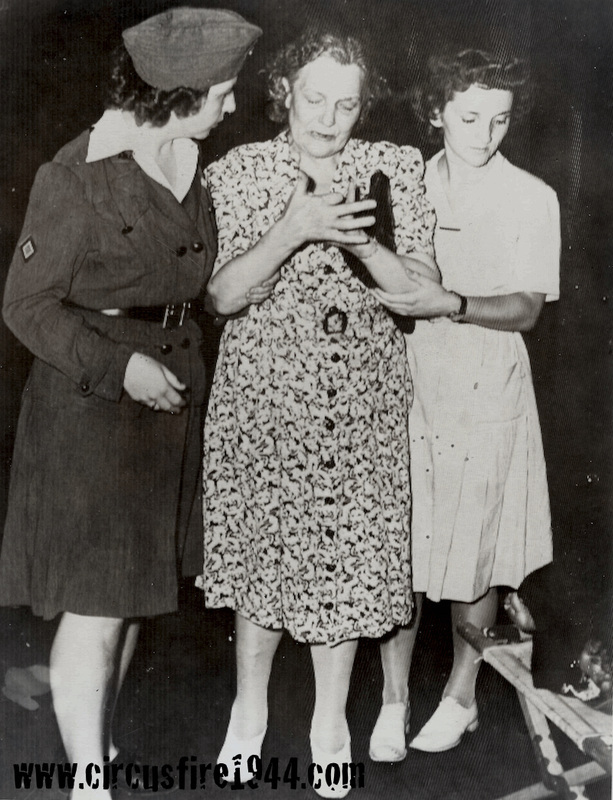 Added photos of Edith Walters and Monica Miles. 2017, July 5: Added new image to the Victim List page. 2017, June 25: Added 21 photos to the After the Fire gallery, low quality images from the fire site soon after the fire. 2017, June 17: Added photos of Carmela Pistorio to her memorial page. 2017, February 26: Added photos of the grave sites of Helen Gray and Evelyn Conlon. 2017, January 6: Added photos of Margaret Garrison, Ada (Hall) Hindle, Edwin Woodward, and Alice, Freddie and Stevie Boyajian. 2016, December 30: Added several photos to the After the fire images page. 2016, July 24: Added a collection of newspaper photos from the days following the Hartford circus fire, from an old scrap book, to Other Images page. 2016, March 25: Added photo collection of Ringling's set up on Philadelphia on June 11, 1944 to Images: Before the fire. 2016, March 17: Added photos of Myrtle Verret and her grave marker, and edited her bio; added grave marker photos of Ida Verret and Evelyn Sartori. 2016, February 12: Added photos of Maurice Goff, Eveline O'Connell, Mrs. Edith Budrick, Rose Berman, Roslyn Kruh, Alice DuHamel, and Elizabeth Goulko. 2015, October 25: Added page Interview with Robert Segee, 1993, including audio/video of Connecticut State Police interviewing Segee about his knowledge of the circus fire. 2015, June 14: Added photo of Fred Verret from 1944 news, added Joan Verret to the Survivor List with link to her story. Added Big Top Burning to the Books page. Added photos to Raymond Erickson's page. 2015, June 6: Created and added new banner to Victim List page.